I am from Michigan and didn’t know there are rip currents on the Great Lakes in places. But being from the Midwest, the sign posted at Pepper Park on North Hutchinson Island was the first place I saw the diagram of a rip current. I learned a lot from just that one sign. My boys and I used to stop at the sign each morning and review the information on rip currents before getting in the water. Just this past week we were visiting again and while in the water I felt a strong suction out toward the ocean. It wasn’t super deep where I was standing so I was fine, however, if that had been my 4-year-old playing too far away from me, it easy to see how he could have been pulled out even in shallow water. We had a great week at the beach and thanks to the signs posted, have always been mindful of the possible hazards around us. Last year, on July 17, Justyna Harrington and her family were at the beach in Sea Bright NJ, and the rip current caught her 9-year-old daughter Gabi. Gabi and her brother Kam are good swimmers but Gabi panicked and was fighting the current. Kam grabbed his boogie board and swam out to her, for roughly 30 yards, and brought her back to the beach. Kam was 6 years old at the time. For this act of bravery and selflessness, Kam, a Cub Scout in Pack 261, has recently been awarded the BSA Medal of Heroism. The Heroism Award is awarded to a youth member or adult leader who has demonstrated heroism and skill in saving or attempting to save life at minimum risk to self. First awarded in 1923, only 121 of these awards have been given in 2011. We are pretty sure that Kam is one of the youngest Scouts to receive this award. NWS notes that while we celebrate teaching live saving skills and heroic actions, even adults who are strong swimmers have died trying to save rip currents victims. Always swim on a beach with a life guard and let the life guard perform the rescue. When not on a protected beach, yell out to the person caught in the rip to swim parellel to the shore. Do NOT attempt a rescue if you are not a trained life guard. This past Saturday evening, my husband and I went to the beach. We go once a year. We waded out in waist high water and had fun jumping into the waves, which were larger than usual. The life guards were flying the yellow flags. We made sure we stayed away from the nearby fishing jetty. All of a sudden we couldn’t touch the bottom. We tried to swim but couldn’t. Then we found ourselves over rocks that were sharp and jagged – probably left from the hurricane. We tried swimming more but it was very hard. It took a bit to realize we were in a rip current. The waves kept breaking over my head and I was getting tired. I started to panic. I kept calling my husband to save me. I was so scared. I also didn’t think the life guard was still there. It seemed like a long time and I finally got back on the rocks. I would swim with the wave then plant my feet in the rocks to hold me when the water rushed out. It was very hard. I finally made it to shore but my husband didn’t. I was worried he would be too tired because he kept coming back for me. I prayed to God to stop the waves and give me strength. He did. I got the life guard and he got my husband. I have never been so terrified in my life. 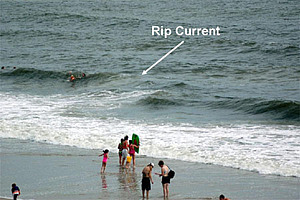 I wish I had read about rip currents before this happened. I’m 51 and my husband is 54. We are in fair shape. If we hadn’t been we may not have made it. On August 8, 2011, my son Ryan and I went for one last swim at Garden City Beach, SC before heading back home. He was riding the waves in and I was just enjoying the cool water as it had been so hot. After being in the water for about 40 minutes I noticed all the waves had gone. About that time we could hear a woman yelling from shore for her son to “come back in, you’re too far out.” We turned our heads to see who she was yelling to and saw this 10 year old boy in distress. He had a Styrofoam boogie board next to him but didn’t realize it was there as he appeared to be panicking. Ryan swam toward him and got to him after about his 3rd time going down. He was under water so Ryan went under and pushed him to the top. I arrived a few seconds later and grabbed the boy at which point he tried to climb on top of me. By this time the people on shore were gathering and, getting smaller. I can’t say for sure how far out we were but it had to be at least 75 to 100 yards. I had a hold of the boy and began swimming, to no avail, back to shore. I swam as hard as I could for what seemed like forever but was probably 5 to 7 minutes. The lifeguards got to us just in time as I’m not sure how much longer I could have lasted. I’ve been caught in a couple of rip currents before but for whatever reason, I did not swim parallel to shore. I don’t think that little boy knew how to swim and was relying on his boogie board for safety. I’m happy to say we are all doing fine. 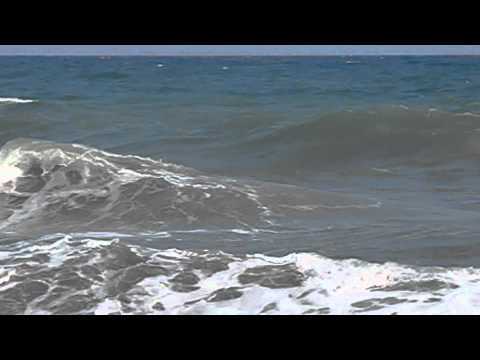 On Jun 21, 2011, I was playing in the surf at Nags Head, NC, with my two sons and my two nephews. We were enjoying crashing into the waves. 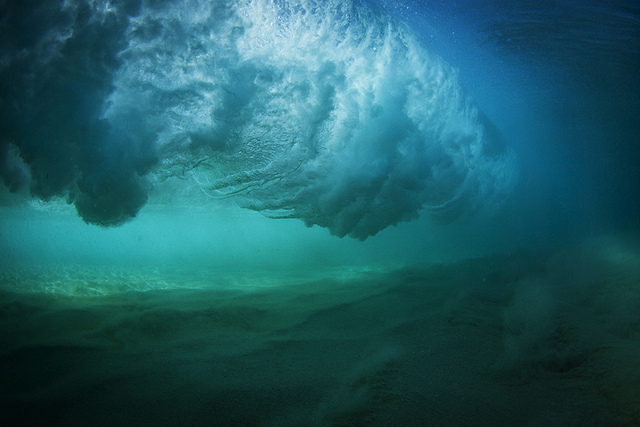 Occasionally, I would dive under a wave and ride the next swell back into the beach. I remember diving under a wave and coming back up and thinking that the water had grown very calm. I looked over my shoulder and thought to myself that I was further out than what I felt comfortable with. I looked back to the sea, so I wouldn’t get pounded by the next wave, and then back to the beach. In that short time I had been pulled farther out to sea and I could see everyone on the beach getting smaller. I was scared but I did not panic. I waved my hands over my head and yelled for help. I knew I was still getting pulled out and that I would need help to survive. I looked up to God and asked for his help because I did not want to die. On the beach, the rest of my family got the kids out of the water and called 911. One of our friends donned a life vest and swam out to me. We floated back into the shore together and got back on dry ground at about that time the first responders arrived. I am 45 years old and a good swimmer. During basic training in the Navy many years ago I learned how to float and how to tread water. I was fortunate on many levels that day, I did not panic and one of our friends happened to have life vest because he had brought his sea kayak to the beach. Our family was probably most fortunate because it was me who was pulled out to sea and not one of our kids. My advice to others is to swim in protected waters and to bring a couple of life vests down to the shore with you just in case you need them. You can purchase these for less than $20 each and had I known of the danger beforehand I would have had these with us. 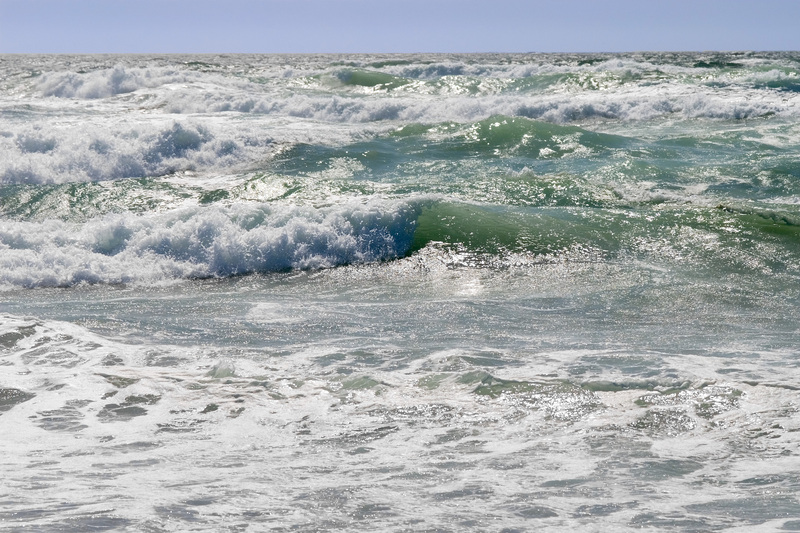 I was caught in a rip current recently and lived thanks to National Weather Service (NWS) materials. We benefitted from the Break the Grip of the Rip campaign and the materials put out by the Eena Project in the Outer Banks in a couple of ways: From the materials left in our beach house packet and the magnet on the fridge, I did remember that we needed to swim parallel to the shore – we had been teaching my nephews that earlier in the trip, since they don’t swim in the ocean that much. What really saved us was remembering the instruction to wave your arm to get help. I did that in a big way and know that was what brought people to us. I think the beaches where we were would have benefitted from more signs like I’ve seen on other beaches. My son, Joshua Scurlock, drowned while swimming with a friend near Patrick Air Force Base in Florida. He was 19 years old. His friend helplessly watched him drown after the exhaustion of fighting the current to save his own life. I tell him every chance I get, that he did the right thing staying on the beach and getting help. Of course, he feels extremely guilty for not going back in the water to save him, something he could not physically do. Instead he did the best thing possible, yell for help. An experienced surfer was just coming in for the day because the waves were so rough and risked his own life to try rescue my son. It took everything within him to pull his body up onto his surfboard and maneuver his way back up to shore. When they reached the beach, he began CPR; however, it was only seconds before paramedics arrived. I don’t really know how long my son was in the water but I can imagine the difficulty the surfer experienced while fighting the current to reach him. He had already drowned when he reached his lifeless body. I thank God every day for that surfer. He brought my son’s body back to me. He could have been washed out to sea and I would not have had the chance to bring him home for a proper burial. Josh grew up in Indiana and we frequently visited Florida, as many other Hoosiers do. I moved Josh to his “paradise” apartment in Cape Canaveral, FL, on September 1, 2004. Josh died November 13, 2004. He was fulfilling his dream, living five blocks from the beach, appreciating the beauty of the ocean every day. He loved the water and he was a great swimmer. Unfortunately, living far from the ocean, he was never taught about rip currents. I’m now trying to raise rip current awareness in my state so that no one else loses their life. I’m told over half of the deaths from rip currents are people from the Midwest. This is all the more reason to raise awareness. 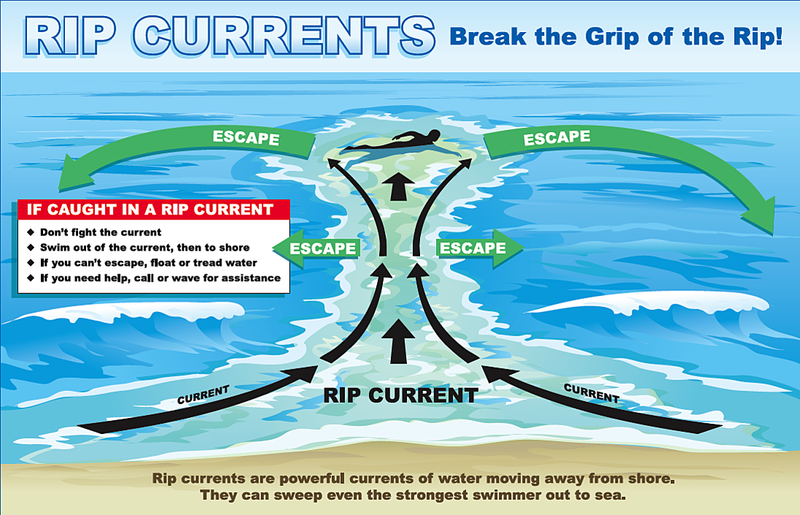 Everyone should know how to escape from a rip current. We teach our children what to do if caught in a tornado because we see a lot of them in the state of Indiana. Why do we not teach them about rip currents? Is it because we don’t have any water here? I don’t know the answer but I’m doing everything in my power to change it. If you talk to people here, they don’t even know what a rip current is, much less how to save their own life if caught in one. I’m starting with the high schools around spring break time. It’s the perfect opportunity to help spread awareness. All of the kids flock to the beaches during vacation. They all relate to my son’s story and realize that this can happen to them. My goal is to reach the entire Midwest through our school systems. John Lane, the heroic surfer who risked his life to bring me my son’s body, gave me the gift of being able to tell my son good-bye and kiss one last time. 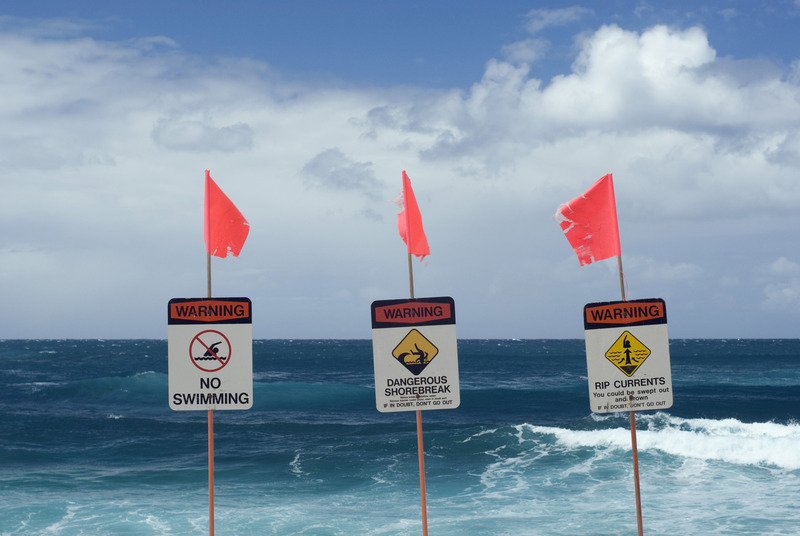 Tell everyone you know about rip currents and their potential dangers of taking a life. Help me in raising awareness, no matter where you live. I hope no one else has to say that kind of goodbye.